I woke up about 5 am, and stayed in my sleeping bag listening to my MP3 player for about an hour. 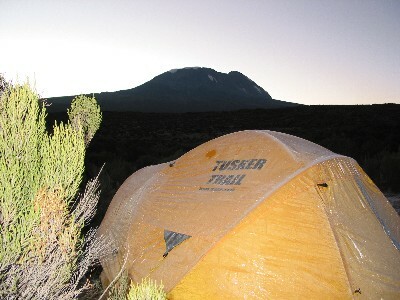 A heavy layer of frost covered the tent and landscape. The outside temperature was about 30o F; inside my tent it was about 40o F. It felt cold to me, but not too bad. I knew that each successive night would get colder as we climbed higher up the mountain. Breakfast was similar to yesterday: toast, porridge, small omelet with half a sausage (or hot dog?) Word had gotten back to the kitchen that Pauline didn't like much salt with her food, and fellow serving the food brought her a separate omelet prepared without salt. We learned that the cook's name is Luka. It appeared that he could speak some English, but we had barely gotten to know him yet. We also found out that the "waiter" bringing us all our meals was named Stanslaus. He spoke even less English, so we got by with "jambo" (hello), "asante" (thank you), and "karibu" (you're welcome). We would not receive a packed lunch today, but would would stop at Fischer camp, which we would pass along the way. Luka would prepare a hot meal for us at this camp site. Elias said that it should warm up when the sun hit us, so he didn't tell us to take any special extra layers for the hike. We found out from Elias that the porter who always carries the medical emergency bag is named Michael. There was no indication that he spoke any English, and he again took up his place at the tail of our trekking group. On the hike, another porter carrying a normal load had been walking with our group for much of the time. He had been talking with Elias quite a bit in Swahili. We figured that he didn't speak English. However, it turned out that he did speak English, and quite well. His name was Bosco. (He was the fellow who spotted the Colobus monkeys for us on the first day's hike.) I ended up talking with Bosco most of the rest of the day, and he was a nice guy. He is attending college, and is "in training" to become a guide himself. We had our hot lunch (with dining tent and chairs as usual) at Fischer camp. We had thought (incorrectly) that Fischer Camp and "Shira 2 camp" were the same place. (The maps we had seen of the mountain and hiking diaries that we had read were inconsistent, at best.) It turns out that Fischer camp is about 1/2 mile north of Shira 2 camp. We had a very good vegetable soup (mostly potatoes, with some green peppers, onions, and carrots). This was followed by deep-fried jelly sandwiches. I'll admit that doesn't sound very good, but they were; they were similar to a Monte Cristo sandwich. 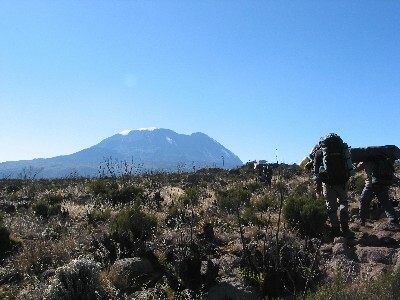 The last hour and a half before reaching Moir camp, the scenery became very stark and covered with volcanic rock. Moir camp is at the bottom of a bowl, surrounded by rocky hills and cliffs. Kibo was visible to the east when the clouds cleared. It looked very high and imposing, looming above us. At camp, we were greeted with a snack of popcorn and warm, roasted peanuts, along with hot water for tea or cocoa. Ellen and Kevin brought a Frisbee along with them, and started playing with the porters. Soon they were having a great time, and played long after Ellen and Kevin quit. On the few occasions when the sun broke through and the wind died down, it was warm in camp. However, most of the late afternoon was overcast, breezy, and very chilly. I put on a couple of extra layers and my thin gloves to keep warm. I knew that it would get very cold that night, the only questions were how cold, and how bad would that feel? When Elias brought out the oximeter before breakfast, my oxygen level had dropped to the upper 80's. If the oxygen level were to drop sharply, that would be a sign that you weren't acclimatizing well to the altitude. My plan was to not start taking the diamox tablets (which speed acclimatization) until there was some sign that I needed it. This morning Ellen and Kevin (or Kelvin, as we had taken to calling him) told us that they had each taken a quarter of a 250 mg diamox tablet. Before dinner, my readings were 85% oxygen level, and 81 pulse rate. Dinner that night was boiled potatoes and a beef / vegetable stew. It was just "OK," and I didn't feel very hungry that evening. Rick wasn't feeling very well on the last part of the hike today and at camp. He tried to have a modest dinner to let his system adjust. We all hoped that he would be over it tomorrow. 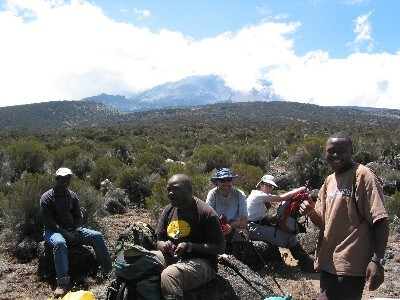 Elias told us that everyone gets sick at some time on a Kilimanjaro climb. (It turned out that Rick was probably suffering from dehydration. He had been drinking about half of the recommended four liters per day, and wasn't eating as much as he should on top of that. When he began drinking and eating more the next couple of days, he felt much better.) Kevin had also been feeling pretty bad the whole trip. He had gotten a sinus infection before leaving the US. This condition, plus the side effects of the erythromycin he was taking, were taking a toll on him, as well. That night the sky was crystal clear, and the views were incredible, with more stars than I'd ever seen in my life. The Milky Way was very bright and unmistakable; it looked like wispy clouds running across the sky from north to south. © Copyright 2005. Michael E. Coltrin, Albuquerque, NM. All rights reserved.